It’s often said that a picture is worth a million words, but pretty pictures alone don’t usually sell listings. Taking the time to dial in your property listings with focused, well-written descriptions will not only help attract the interest of prospective buyers, but can also help drive valuable traffic to your website. Don’t fret if you’re not the literary type – what’s mainly needed to write the best real estate listing description are a) your experience as a realtor, b) a spelling/grammar checker, and c) keeping SEO in mind (which is actually much easier than it sounds!). But before you roll up your sleeves and begin pounding the keys, here are some powerful pointers to help you get started. 1. Always keep one eye on SEO: SEO (search engine optimization), in simple terms, refers to methods and strategies used to improve a website’s search rankings. Search engines use lots of different criteria to determine the results of user searches, but one of the main things they check sites for are the abundance and frequency of the words (keywords) typed into the search box. To increase the likelihood of site visitors finding you via Google and other search engines, try to anticipate the keyword phrases your average buyer would use to look for properties, and work them into your descriptions. A useful online resource is SEMrush to help identify the best key words and also helpful when generating real estate blog posts on topics you want to target and rank. When deciding on keyword phrases you’d like your site to rank for, narrow them down to factors such as specific area (if you sell a lot of homes in a particular neighborhood, subdivision, development, etc), property type, school district, and access to local attractions. For example, it’s far easier to compete for search rankings for “Northstar Golf Homes” (a resort community) than “Lake Tahoe homes” (a very large geographic area, without any other details). 2. Use our Featured Listings add-on (real estate listing template) to give your listings star treatment: When showcasing listings on your website with IDX, you have the option of simply displaying the listings that you’ve entered into your local MLS. However, while a robust IDX solution can attract leads to your site and make it more user-friendly, the listing descriptions entered in a MLS and displayed via IDX are seen as “duplicate content” by search engines, because every other IDX-enabled real estate site using the same MLS data may display the exact same listings. Consequently, you wouldn’t be getting the same potential SEO benefit from your listings as you would from say, a well-written, keyword-rich featured listing page on your site. That said, we offer a premium site feature – our Featured Listings add-on – that enables you to publish your site’s listings as SEO-friendly original web content, with plenty of added visual flair to boot. In addition the ability to display larger, eye-catching photos, links to PDF flyers and videos (you can embed the videos into the listings themselves), and the listing pages are designed to be seamlessly integrated into the larger site layout, giving them a highly professional polish (A great website feature to show potential sellers on listing appointments). Contact us to learn how our WordPress real estate websites can give your listings the spotlight they deserve! 3. Figure out what buzz words work, and avoid the rest: in your experience as a REALTOR, you’ve probably noticed that some words catch the eyes and ears of buyers, while others can just as easily work against you. Some obvious selling words, such as “luxurious” and “beautiful” are fine, but what’s often more effective are words that communicate that a property has the qualities and features a buyer already has in mind. Studies show using powerful selling words such as “starter home”, “landscaped”, “granite”, “spotless”, and “upgraded” speak directly to buyers’ interests. Conversely, the use of “clean”, “motivated seller”, and “move-in ready” may imply anxiousness to offload a listing with few redeeming qualities. Rustic lakefront cabin with breathtaking views: if you’ve been searching high and low for a North Lake Tahoe cabin that blends mountain charm with modern flair, look no further! Awake on summer mornings and step out onto your spacious back deck, and ponder a thousand possibilities for your day’s itinerary: amazing trout fishing, water skiing, fine dining, music and craft beer festivals – all within easy walking distance from your door. When the temperature drops, you’re located less than ten miles from Squaw Valley and Alpine Meadows. And whether you’re coming in from the sun or the cold, you’ll feel right at home in this cozy 2 bedroom, 2 bedroom with maple flooring, fieldstone fireplace, and granite kitchen countertops and a generous center island. Don’t let this dream pass you by – schedule your private showing today! 5. It’s the little things (that mean a lot): while you might assume that a home’s double car garage or inground pool will seal the deal, many homebuyers – particularly young, first-time homeowners – are immediately concerned with features that address their day-to-day needs and lifestyles. Don’t neglect to mention washers/dryers, smart home thermostats, walk-in closets, and especially not the wet bar in the basement (hello, man cave!). 6. Location, location, location: when anyone imagines their dream home, they also have a larger setting in mind. Is it close to good schools, entertainment, resorts, etc? Is it within walking distance of public transportation, or or a reasonable driving commute to work? How are local taxes? How’s the view? Draw upon your own experiences with homebuyers, and make sure to broaden your descriptions’ focus to include area information that speaks to such concerns. On a related note, our Neighborhood add-on feature is the perfect showcase for popular neighborhoods, subdivisions, and other areas that drive home sales – and internet searches. Consider IDX MarketBoost to include on neighborhood pages that offer automated market statistics and allows visitors to sign up for automated email market reports. Very cool! 7. Mention similar listings in/after the closing paragraph: maybe the fixer-upper farmhouse that lead a visitor to your site isn’t quite what he or she’s looking for, but that nicely-priced, renovated colonial down the road might be just right. At the end of the listing’s description, list a few similar properties and hyperlink them to their respective listing pages to broaden their visibility. 8. Link listings to neighborhood pages on your site: many markets are hyperlocal in focus, meaning that prospective homebuyers often search online for communities and subdivisions.. Dedicated pages on your site featuring demographic information and listings in a specific area can give visitors a good idea of what that area currently has to offer. And if you’re not sure how to display neighborhood descriptions, photos, and listings neatly on a single webpage, we submit for your consideration our beautiful Neighborhood add-on feature, which makes creating snazzy neighborhood profiles a breeze. 9. Don’t forget to proofread, edit, and revise: a few typos are all it might take to shake a potential buyer’s confidence in you as a competent professional. Always proofread your listing descriptions thoroughly, and it’s also a good idea to read them out loud before they’re published on your site. If they don’t sound good, they probably don’t read well either – so make them sing! Your website is a valuable lead generator and excellent tool for keeping in contact with clients. 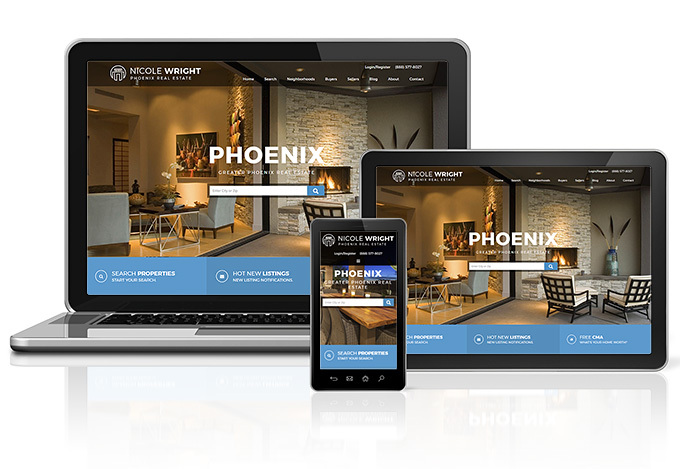 If you are looking to upgrade to a powerful responsive website then please take a look at our real estate website designs and IDX solutions. We are happy to answer questions you may have and show you what we can do for your real estate business. Learn more about our real estate website services or contact us at (888) 577-8027 ext 1. I never thought about how certain buzz words can make you think about a real estate listing. Thinking back on it I definitely have noticed some desperation on the part of those using the term “motivated seller” and often the property reflected the same. Using the right words is sure to have a huge impact on a listing.